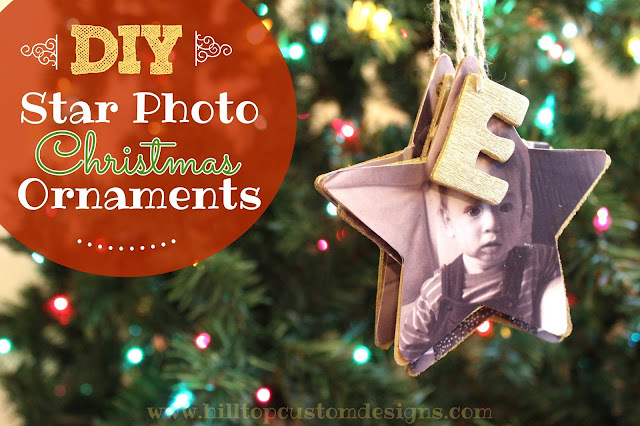 Today on the blog i've got this cute and easy tutorial for DIY wooden star ornaments made from your family photos! :) This is a cheap craft, especially if you already have some of these items on hand at home or you can print your own photos at home. PS: If you don't want to make these yourself, I can make them for you. Just click here. Before we begin... To keep this even cheaper I bought a tiny can of metallic spray paint because I knew i wouldn't need a large one. I would have bought a small bottle of Mod Podge as well but they were out of stock, so I had to go with the larger bottle. I also printed my photos at home off my Canon photo printer on my own photo paper, but if you can't do that you can print at a kiosk. Walmart was my store of choice - they sold EVERYTHING I needed for this craft. 1. Go outside or to a well ventilated area and lay out your wooden stars and small letters onto a large sheet of paper (I used freezer paper but anything will work). Spray your pieces, coating them evenly. Allow to dry then flip over and spray the reverse side as well. Allow to dry completely. 2. 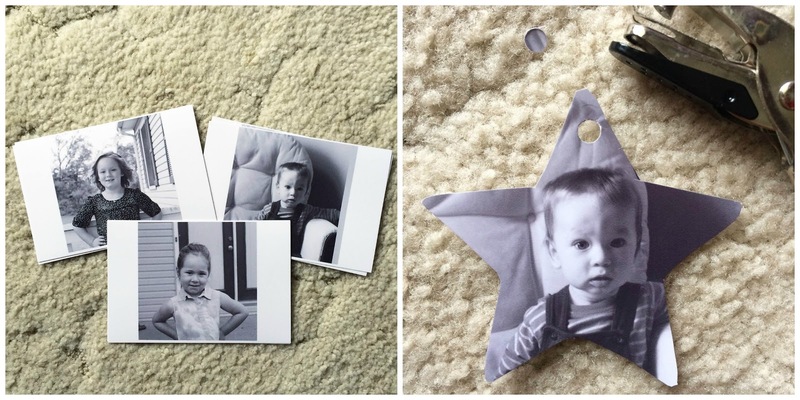 If you're using your home printer and also using the exact wooden stars I used from Walmart, now it's time to print ONE - 3.75" photo onto each 4x6" sheet of photo paper. I have a Macbook so I used Pixelmator to create these as shown below. **If you're using a kiosk simply take your photos to the kiosk and print there. Make sure the face(s) on the photo will fit within a 3.5" x 3.5" area with some excess around the edges to cover the star points. 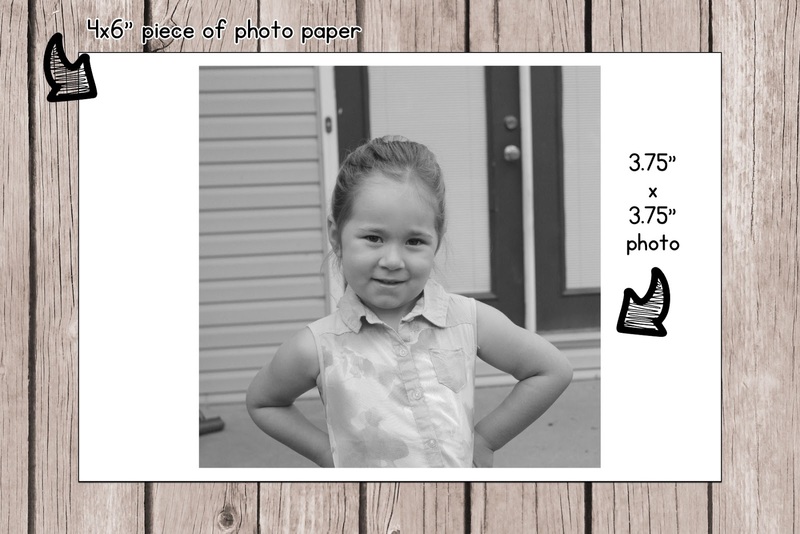 If using a 4x6" print ensure the face isn't too large on the photo - try to get it directly in the center if possible. 3. 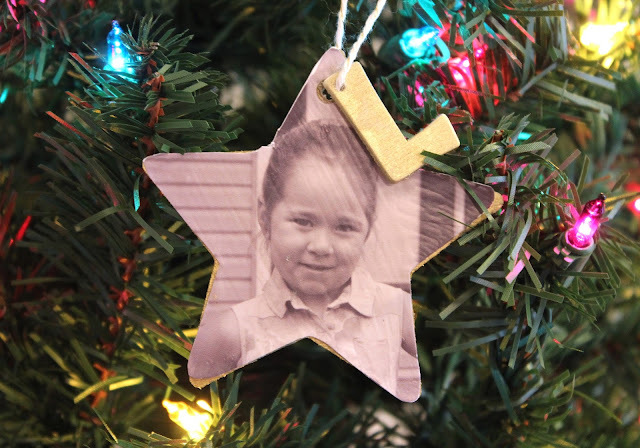 Using a wooden star, place it on the top of each photo then trace the edges with a pen and cut out with scissors. Ensure the face is roughly in the center of the star as shown below. Next, use a hole punch and punch out a hole at the top of your photo as shown below. This will be the guide we use to determine where to drill a hole in our stars. 4. Coat one side of each star with Mod Podge using your foam brush. Place your photos ontop of each star and smooth down. Allow to dry completely. *Additional step: You can also add a thin layer to the top of your photo once it is on the ornament to "seal" it and give it a nice finish, I bought Mod Podge with a matte finish exactly for this reason - it gives the photos a nice antique look, especially with the gold paint underneath. Finish Up: Using a 6-8" piece of twine, create a loop through your ornament hole and your small letter, making sure the letter is facing the correct direction - then knot on one end. 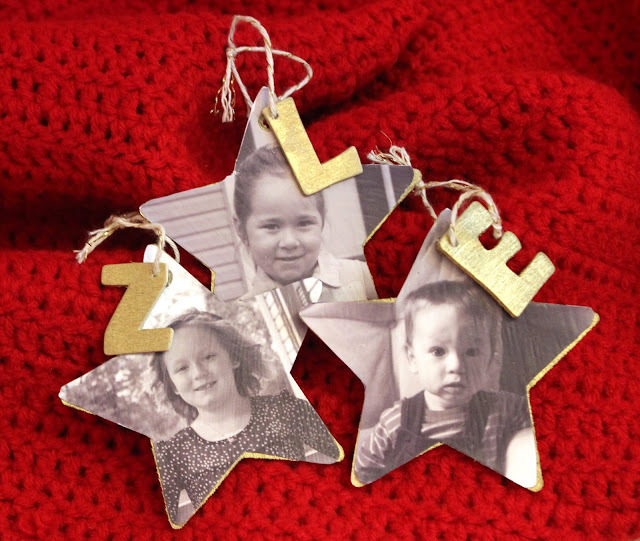 EXTRAS: Any wooden shape will work if you cant find stars, twine can be substituted for ribbon, jute, etc and you can use paint or a permanent marker to write the year and name of each person on the back of your ornaments. If you've got leftover wooden pieces, have the kids paint their own ornaments as well to use them up.